It's rare to find photos of the Uptown showing the audience...and this one is quite unique! Currently for sale on eBay. 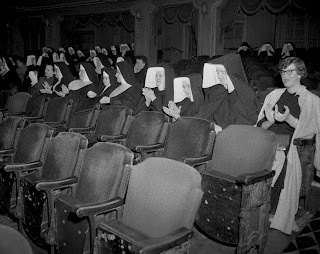 From seller's description: Nuns from various orders in Chicago attending a special viewing of the film, Thunder On The Hill, at Uptown Theater, October 20, 1951. Charlotte Hastings' West End stage hit Bonaventure was adroitly translated to the American screen as Thunder on the Hill. The bulk of the action takes place at convent, presided over by Sister Mary (Claudette Colbert). Circumstances -- namely, a dangerous rainstorm and raging flood -- dictate that the convent become a stopover for Valerie Carns (Ann Blyth), a convicted murderess who is being escorted to Death Row by a brace of guards. Slowly becoming convinced that Valerie is innocent, Sister Mary sets about to clear the girl and bring the genuine killer to justice. It goes without saying that said killer is also a reluctant guest of the convent. A superb shadow-laden climax in the convent's belltower caps this heart-pounding mystery melodrama.